Do you want to create a beautiful video gallery in WordPress? As you know, we can point out a number of WordPress plugins to add an image gallery in websites and blogs. Luckily, you can also create a video gallery there in simple steps. In this guide, we will tell you how. 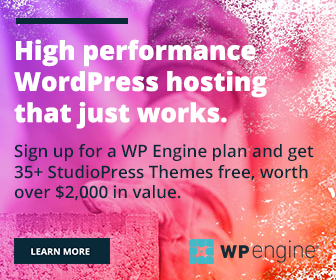 Install and activate Huge-IT Gallery plugin from the WordPress library first. It is a simple, light-weight plugin to show unlimited video galleries in posts and pages. Huge-IT Gallery delivers full responsive videos with 7 advanced views and support to the lightbox, playlists etc. You can insert YouTube, Vimeo videos into the gallery and display them using a shortcode. After activation, you will see a new top-level menu in the left pane of WordPress dashboard – Video Gallery. 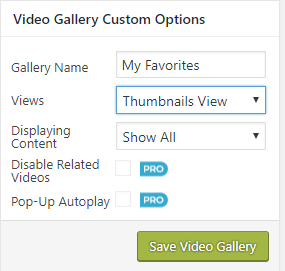 Open the menu and hit Add New Video Gallery button to create your first video gallery. Click on Add Video button to start inserting your videos. Enter the video URL from YouTube or Vimeo and Insert. Once the video is inserted, you will get the following kind of screen. Enter title and description for each video. Give a gallery URL if needed and choose to open the video in a new tab or not. Name your gallery from the right side menu. 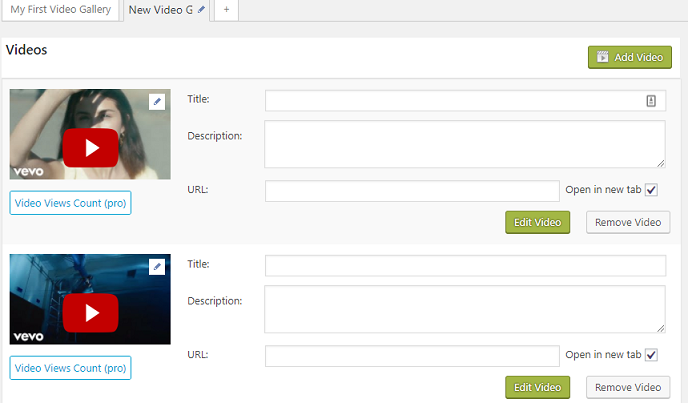 Configure other options like the type of views and displaying contents. Huge-IT allows you to show videos in content popup, lightbox, content video slider, thumbnails, video slider and blog style gallery. Save your changes. 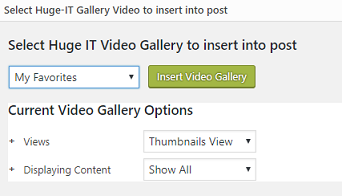 In two ways you can insert video galleries in the WordPress content area. Either by a shortcode or through the page editor menu. Open a page in the editing mode where you want to insert the gallery of videos. Click on Add Gallery Video button that appears next to the Media upload. Choose your gallery from the drop-down box, manage other parts and click on Insert Video Gallery. The plugin will automatically insert gallery shortcode into your content area. Move it to the desired part of the post. Publish or update the post.